Hello! I'm just popping with a quick post today. 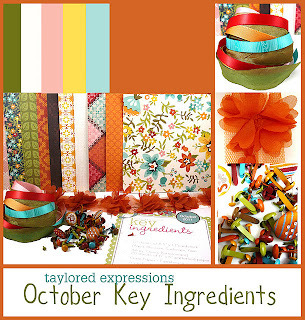 I thought I'd show you a simple card that I made with this month's Taylored Expressions October Key Ingredients kit. Earlier this month, the team posted some wonderful projects that are sure to inspire you. You can check it all out on the KI blog, HERE. If you're not yet a Key Ingredients subscriber, I hope you'll consider joining us! Take a peek around to find all the information you need to know about our kit club! Click here to learn more about subscribing or click here for our FAQ page! Pumpkin Mum Trim, Brads (October Key Ingredients); Foam tape, Thread, Sewing machine. Such a sweet card Stephanie! 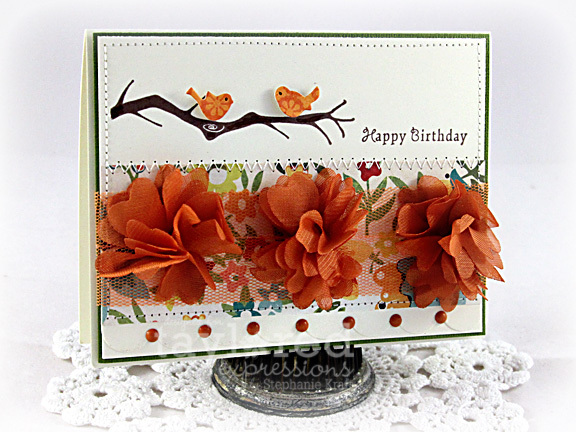 Love the 3D fabric blossoms and sweet little birds! Ohhhhh....I LOVE this!! Everything is just perfect...seriously, I think this is one of my favorite cards from you!! Gorgeous! WOW! What a beauty! I love how you added the flowers. They look stunning.